We are HUGE fans of Christmas over here. Not that we don't appreciate Thanksgiving, because we do. I love some good family time and pumpkin pie but there is something so magical about the Christmas season. The lights, the music, the cookies and decorations. The fact that I have two little boys who are awe struck by the sight of Santa definitely adds to the fun. So, in an effort of full disclosure we went to see Santa at HGTV's Santa HQ event the minute we could and that minute could or could not have been before Thanksgiving. Ha! We went with some of our favorite peeps to the see jolly Saint Nick. The cuteness overload is almost too much to handle with these four. (I'm a little bias, I know) This motley crew stood still for about 2.3 seconds so I could get this picture. One second later, they were running circles around us. The Santa HQ station at Fashion Fair mall by HGTV is not your ordinary meet Santa set up. I've done the hour long wait in line for a 1 minute interaction only to have kids that are tired and over-it. 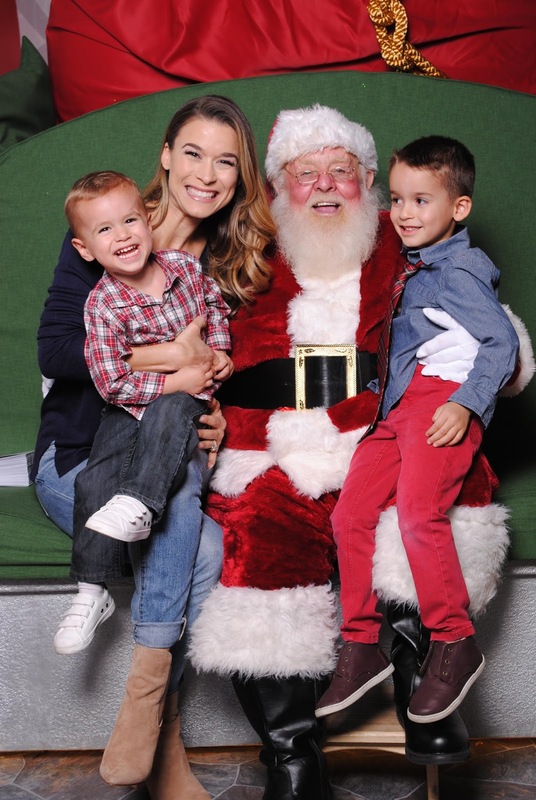 The Santa HQ event takes meeting Santa to a whole new level and they do so with the kids in mind. We were greeted at the front by some of the sweetest elves. Then they walk you through one of several different interactive stations. First up was checking Santa's naughty or nice list. You enter your child's name and push the button. Then you watch the list scroll through until it finds your name. Not sure how this little munchkin made the nice list but he made it by the skin of his teeth. The next two rooms were full of electronic magic. From taking pictures and making personalized elves who danced and sung, to holding up the tablets to unlock special elf cabinets and uncovering special elf presents. Last but not least was a Santa's village picture with props and the meeting the BEST SANTA EVER. This Santa was the sweetest and most patient I've ever witnessed. He was very interactive with both boys. Colton was into it 100%. He sat on Santa's lap for about 5 minutes and shared his little heart out. Santa not only listened but participated and gave the sweetest hug. Bronson was a little apprehensive solo but when I agreed to sit with him, he was happy as could be and was sure to tell Santa about Spiderman and Batman. At the end you can get printouts of your photos and get digital copies for friends and family. This is our second annual time going and it definitely won't be our last. These photos are adorable. Your children are gorgeous and I love their Christmas outfits. What an adorable post!